OTTAWA - Parliament's key watchdog agencies say a Conservative bill aimed at exposing potential partisanship in their offices raises problems of basic fairness and could actually stop or hamper their own investigations. 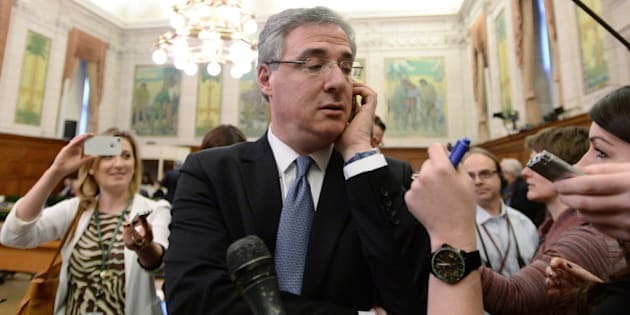 Tory MP Mark Adler's private member's bill would allow any MP or senator to accuse an employee of an office such as the Auditor General's or Elections Canada of partisan conduct and demand an investigation. It also proposes to force employees of those agencies to make a public declaration of their political activities going back a decade. That's not sitting well with eight officers and agents of Parliament, who wrote to the Commons ethics committee to register their concerns. Three of appeared before MPs at a hearing Tuesday. Ethics Commissioner Mary Dawson, Chief Electoral Officer Mark Mayrand and Auditor General Michael Ferguson all questioned the necessity of the bill when other statutes and codes already require the non-partisanship of their employees. They took issue with the fact an MP or senator could lodge a public complaint against an employee for "partisan conduct," but that the bill has no definition of that term nor a specific threshold for when an investigation must be launched. "The problem is that there's absolutely no test as to when somebody can make a complaint. At least in my act you have to have reasonable grounds...," Dawson said of the Conflict of Interest Act she enforces. "Under this (bill), nobody has to even think up reasonable grounds; they can just fling mud." In the letter sent to the committee, the agents also warned that such probes could "halt or hinder an ongoing file, audit or investigation and cause undue delay." And Ferguson raised privacy concerns of having a junior or mid-level employee's past political jobs and current employment posted publicly for the world to see. He and his colleagues worried the bill might also run afoul of hiring rules that are focused entirely on merit. "The way that it is drafted now, there are some irritants in it that it would cause that really aren't necessary and wouldn't help our independence," he said. Adler, who appears to have the backing of the prime minister's office on his bill, said it was drafted in keeping with the government's general commitment to transparency and accountability. "This bill identifies nine specific offices with unique responsibilities and roles," said Adler. "Given their specific watchdog duties, it is imperative that the so-called agents of Parliament are seen to be non-partisan and free of political influence." NDP ethics critic Charlie Angus pressed Adler unsuccessfully to provide an example of partisanship at any of the watchdog agencies, which also include the offices of the privacy and information commissioners. Angus suggested that the bill could allow an MP or senator under investigation to deliberately derail the work of someone like the auditor general by casting aspersions on an employee. "Tell me if I'm wrong, if Mike Duffy was still a sitting senator, Mike Duffy would be able to demand an investigation of the ethics commissioner, even though the ethics commissioner couldn't investigate Mike Duffy, is that correct?" Angus asked, referring to the former Tory senator facing unproven RCMP allegations of bribery and fraud. Adler did not stop to speak to reporters following his appearance at the committee Tuesday.